I am very happy that you have been able to come and want to greet everyone kindly. Before I begin speaking about Buddhism and the mind, though, I wish to remind you to generate the pure motivation, which is to understand and practice the Buddhadharma for the benefit and welfare of others. Having attained complete and perfect awakening, Buddha Shakyamuni offered an inconceivable variety of instructions. The purpose of all teachings is to help sentient beings become free from suffering and to establish them in a state of stable and excelled peace and happiness. Within the context of this vast variety of teachings given by the Buddha in order to free sentient beings from suffering and to establish them in the state of liberation, the state of omniscience, one essential factor binding all paths presented in all teachings and the practice necessary to affect this awakening is the correct recognition of the manner of abiding of any individual. Although it is true that external things are the contributory conditions to one’s experience of suffering, it is necessary to have the correct recognition of the manner of mind’s abiding, i.e., to know that the basis or cause for the experience of suffering is that which actually experiences and makes experiences possible - the mind. If one does not correctly recognize the mind’s true nature, one will not be able to prevent the arising of suffering which occurs through the influence of external conditions. Mind itself changes. It is the mind that is the basis for the distinction between the experiences of suffering and the experience of the transcendence of suffering. Therefore it is said that nirvana and samsara are contained in the mind. Since the mind is the basis for the experiences of suffering, which is samsara, and the state of omniscience and liberation, which is nirvana, then we commonly have the attitude that suffering arises from the coming together of causes and conditions in the external world and there is nothing in the mind that is the basis for suffering, which is incorrect. One thinks one can bring an end to suffering by altering the external world and, when having done so, one will then be able to attain a state of stable happiness. But this is not true. It is necessary to recognize that there is a connection between one’s body with which one experiences the external world and one’s own mind. In Lord Buddha’s explanations, there are three types of suffering. They are: all pervasive suffering attended upon that which is composite; the suffering of change, and the suffering of suffering. Usually one’s experiences of suffering only concern the second and third kinds, the second being the experience of suffering when pleasant conditions change into unpleasant situations and the third being the actual experience of physical or mental pain. Even though one experiences these as suffering, one does not recognize that the basis of their presence in one’s experiences is the fact that one falsely apprehends the “five aggregations of being,” called skandhas in Sanskrit, as a self. The five skandhas refer to the five principal mental-physical constituents. Based on this mistaken apprehension, i.e., based upon clinging to the skandhas as real, pervasive suffering arises and brings forth the other types of suffering. As it is, though, one experiences obvious suffering as suffering and believes it is caused by something external. For example, the first cycle of teachings that Buddha Shakyamuni presented deals with the Four Noble Truths. The first Noble Truth concerns the presence of suffering. The Buddha did not teach that suffering is something to be avoided or blocked, rather he taught that it needs to be understood. It is through understanding the nature and causes of suffering that one comes to avoid the actual cause. The second Noble Truth concerns the cause of suffering and teaches that there are two principal causes for suffering: “afflicted actions,” karma in Sanskrit, and “disturbing emotions,” klesha in Sanskrit. The root of both is, as just said, the false apprehension of the five aggregates as a truly existing self. If one wonders why the Buddha said that the false apprehension of the five aggregates as a self is the basis of all suffering, he meant the following: In the beginning, one fails to recognize the actual manner of mind’s abiding, particularly that it has two characteristics, namely that it is in essence empty of intrinsic existence and it is in aspect clear and lucid. Failing to recognize the essence of the mind, which is devoid of an own identity, one falsely apprehends the essence as a self, as an experiencing or cognizing self, and calls it “my personal self.” When experiencing things in that way, one develops a false apprehension of cognized objects and thinks that they are apart from a cognizing consciousness, thus asserting the inherent existence of external objects, which are also devoid of an own identity. Due to the interaction of the two falsely imputed selves or elements, one develops and clings to an apprehending subject and apprehended objects. So, it is on the basis of failing to recognize that the mind’s essence is empty or devoid of inherent existence and its aspect or manner of abiding is lucid that one erroneously imputes the two falsely asserted selves. One consequently experiences what one experiences as being an experiencing subject and experienced objects. Failing to recognize the mind is referred to as “co-emergent ignorance.” It is important to understand that co-emergent ignorance is the fact that the mind does not recognize its own nature; it does not refer to an ignorance that is inherent to the mind’s true nature. Due to the ignorance of not realizing one’s mind’s true nature, one develops attraction towards and attachment for that which is experienced as pleasant. One also develops repulsion or a dislike for that which is experienced as unpleasant. At this point, there are three afflictions in one’s mind: ignorance, attachment, and aversion. These three poisons are the bases or source of all afflictions one experiences. What happens at the point of the presence of the three disturbing emotions is that the mind loses control or freedom. In that case, the mind is overwhelmed by the disturbing emotions and causes the body to engage in actions, and the term karma, i.e., “action,” comes in. The three afflictions can be classified as five, but there is a great variety of mental states which arise in this way. Due to the presence of the afflictions, one makes many plans, which one puts into action with one’s body and speech. Whether virtuous or non-­virtuous, all physical and verbal activities are based on afflictions and cause an imprint or habit-pattern to be impressed on the “all-basis consciousness,” alaya-vijnana in Sanskrit. Performing actions based on the apprehension of duality and the impressing of the imprint of the actions as a habit-pattern on the all-basis consciousness is the active process of karma. There is always a great deal of discussion of karma in Lord Buddha’s instructions. We often think of karma as something physical, because it is defined as “action.” But karma is simply the placing of habits in the mind. Of course, at the time of the creation of karma, it is created through actions of body, speech, and mind, as can be seen in the list of the ten virtuous and non-virtuous actions carried out with an intention. Nevertheless, the imprint or habit rests in the mind, not in the body. If karma were a physical thing, one could easily throw it away and thus eradicate non-virtuous karma and gather virtuous karma instead. It is not the case that karma is something physical, rather it is a habit that is generated in the mind of the person who performs actions, the reason it is somewhat difficult to purify and overcome. Should karma be physical and reside in one’s body, then at death karma would end. However, since one’s karma resides in one’s mind as a habit, one can’t get rid of it at death. Therefore, as long as the basis for the accumulation of habits – which is the false apprehension of one’s experience of an apprehending subject and apprehended objects – is not relinquished or liberated, one will never be free from suffering. In Tibet, there is a saying and it’s a true and accurate description of karma: “If you want to know what you did in the past, look at your body now. If you want to know what will happen to you in the future, look at what you are doing now.” This saying illustrates that karma is not limited to one life or ends when the life in which the actions were carried out is completed. This saying means that it is on the basis of one’s actions that one experiences results. In more detail, this saying points to the fact that everybody wants to be happy and nobody wants to suffer, yet everybody experiences different situations. Despite the fact that every living being wants the same thing, they experience the results of their own actions from previous lives. For example, some people have a very excellent external environment - they are wealthy and live in nice houses, but they are very unhappy and are never content. Others are very content while living in less pleasant places. All variations result from previous actions. The vast variety of different experiences comes from and is an indication of karma, of the results of actions, and this is what is meant by causes and results. It is because the mind has no control over itself that the situation of suffering resulting through actions arises. It is therefore said that spinning around in samsara is endless. In Tibetan, the word for samsara is kor-wa, which means “to spin around” or “revolve.” It doesn’t end until the mind has control over itself - suffering will not end until one stops apprehending things falsely. Although there are many practices and paths taught in Buddhism, they are all intended to help students control their own mind, principally through the generation of mindfulness, awareness, and circumspection. One can isolate the various disciplines of the Buddhadharma, such as those set forth in the Hinayana, Mahayana, and Vajrayana. For example, in order to generate a tranquil state through the observance of physical, verbal, and mental discipline, one turns one’s attention towards a state of freedom or control. Also, meditation upon the awakened mind is practiced so that followers gain control of their own mind. In general, the practice of meditation serves as a remedy to the existing habits and the habitual imprints that cause one to perceive things dualistically. Through the practice of placing a new habit that reverses the existing old and unsatisfactory habit, one eventually becomes victorious over all habitual imprints. It can be said that the essence of the great variety of instructions taught by Lord Buddha concerns taming the mind. And taming the mind means nothing other than surmounting karma and mental afflictions through the removal of the habitual imprints and through returning to the mind of freedom and control, particularly in reliance upon the cultivation of mindfulness and awareness. Therefore it is very important to continually rely upon mindfulness and awareness. If one can continually rely upon both – not only during formal meditation practice but also during all activities in one’s life – then it is the practice of the mind according to the Buddhadharma as it was taught. When the mind is turned to its natural state of freedom, it is endowed with inconceivable values of being. Question: You mentioned the five aggregates and I would like to ask you to explain them. Rinpoche: The five aggre gates are form, sensation, perception, mental formations, and consciousnesses. The reason they are called “aggregates” is because each one consists of many things. No skandha is independent, has inherent existence, or is an isolated, self-existing entity. Question: Mind is empty and clear. The initial perception is of the self, then follows the perception of other. Is that correct so far? Rinpoche: When it is said that the essence of the mind is empty, this does not mean absence or nothingness in the sense of an empty vessel. It means that the mind is not a thing that is compounded; it is not a physical object and has no color, size, or location. The mind is beyond the four extremes of either existing, not existing, both, and neither. It is also beyond the eight elaborations of birth or coming into existence, cessation, permanence, and so forth. This is what is meant when it is said that the mind is empty. The mind cannot be apprehended as anything in particular - it is in its essence empty. Nevertheless, it is unimpeded or lucid in its manner of manifestation. While we cannot point to the mind and identify it, it is lucid, i.e., we experience things and it is possible to experience the vast variety of things. This lucidity is what is referred to by such terms as, for example, “self-cognizance” and “self-lucid.” Ignorance means misunderstanding the empty essence as being a self, an “I.” For each one of us, there is an “I” or a “me” that we cannot see. In any case, I’ve never seen it. The imputation of that which is other than the “I” on the basis of the lucidity of the mind occurs because one has already imputed an “I.” When one experiences the multiplicity of things that arise for the mind, one automatically calls everything else “other.” Because we divide experiences into “me” and “other,” we experience every interaction between these two as an apprehending subject or consciousness and apprehended objects. This is what is meant by clinging to a false apprehension of duality or dualistic appearance. Did that answer your question? Same student: I want to go further. In Buddhism, it is taught that we separate self and other, but permanence and impermanence are natural. Rinpoche: Yes, there is an apprehension of an aspect that is the apprehended and there is an apprehension of the apprehending consciousness. Student: Is there a separation between self and other? Rinpoche: Yes, w hat is referred to as the self of a person is simply the imputation or belief in an “I.” But within the apprehension of phenomenal self, there are both the apprehended object and the imputed apprehending consciousness, which is a further development based upon the previous. For example, when you think, “My pen, my clothes, my chair,” you do this within the aspect of the self of phenomena. Student : So, it’s a misapprehension of a self? What, then, is accumulated as karma or merit is not really showing up in there. Rinpoche: Th at is a very good point. In ultimate reality, accumulated karma and the basis of accumulation are non-dual. The one is not different than the other, which is meant by non-duality of samsara and nirvana. However, from the point of view of confusion, from the conventional or deceptive level, there appears to be someone who accumulates and an accumulation of karma. If we take virtuous actions as an example for how this works, there are the six perfections or six transcending virtues spoken of in the Great Vehicle extensively. The first is generosity. Now, in general, a virtuous action is anything that benefits another being and a non-virtuous action is anything that harms another being. Any form of generosity that benefits someone is a virtuous action. But for an action to be a perfection of generosity, for example, it must be an act of generosity in which the performer of the action does not conceive of the performer of that action, the action, or the recipient of what is given. Therefore, it is said that ultimately there is no accumulation of karma. Yet, one must rely upon the conventional level of existence in order to experience or realize that which is ultimate. Through the practice of a transcendent virtue one comes to realize what is actually real. Question: I didn’t understand the difference between virtue and great virtue. Rinpoche: Great virtue is non-conc eptualization of the three elements of an action. There is a difference between ordinary and perfect virtue. For instance, when you give something to somebody, you normally cling to the thought that you are the one who is giving. You also cling to the object you are giving and to the one you are giving to. This is ordinary virtue, which certainly benefits others. Extraordinary or perfect generosity means being free of clinging to a subject, object, and the action of giving. This is realized after one has understood shunyata, i.e., “emptiness.” The perfection of generosity occurs when one has realized emptiness and is free of clinging. Until then, one learns and practices. Question: We are speaking through an example, perhaps giving unconditionally, giving through perfection. Is that what is meant? Without clinging, you do something freely and there is no further thought of it? 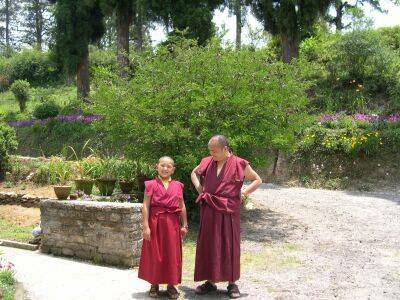 Rinpoche: It is not exactly giving without a thought. It’s not just giving away something you don’t cling to or don t want. Student: Okay, I mean detachment. You have no expectations from the other person? Rinpoche: You can’t say that’s exactly the same as non-conceptualization of the three elements of an action. But, giving without any attachment or craving is very good – it is fitting. Question: You were speaking of the mind as a state beyond existence, suggesting to me that the mind is the one great mind of which we are in the illusion of an individual self. Rinpoche: One can say that each one of us has an individual mind on a conventional level. When the actual nature of the mind is realized, there cannot be said to be either one or many. Just as the mind is beyond the extremes of existence and non-existence, it is beyond the extremes of being singular, dual, or multiple. Also, one cannot speak of better or less good minds – mind’s true nature is beyond all that. For this reason, omniscience is possible, the state of Buddhahood being omniscience. Question: You said we have karma and can recognize it by looking at our body and the way to see future karma is to look at the body. Rinpoche: It says “body” but means you can look at what you are experiencing during this life - happiness or suffering. So, the term “body” refers to life. Student: Is it the situation? Student: What would you know by that? Rinpoche: If you have difficulties and experience suffering, you realize that it is the result of negative karma from past lives. If you have a good life, you realize that it is the result of previous good karma. The word “body” in this context means one’s experience of this life. The statement means that the proportion and variety of happiness and suffering one experiences in this life results from karma. Although everyone wants happiness and does not want to experience suffering, nevertheless some people experience more suffering than others. There are many varieties. Some people have painful sicknesses, others experience painful mental anguish, and so forth. Some individuals are very happy and content. The cause for this is actions performed in previous lives. Question: Is it important to have the detail of this to help transform habits into something new? I find that by having some instinct of where the habits are coming from helps me to get rid of those habits. Is it necessary to know the details of the causes? Rinpoche: It is very good if you know them. Question: Rinpoche, if the mind is self-knowing, what causes co-emergent ignorance? Rinpoche: That is in fact why it is called “co-emergent ignorance.” Every being experiences intermittent presence of self-cognizance or the Buddha nature. But those experiences are mixed with a co-emergent or an accompanying experience of ignorance, of obscuration. Both are present for everyone. No matter how obscured one is by one’s own actions and mental afflictions, there are flashes of recognition of one’s Buddha nature. That is what is meant by the fact that one can’t see it because it is too close. Question: It still appears as though there is an actual accumulator of karma, whether virtuous, perfected, not so virtuous, and not so perfected. Somehow it returns. I’m not sure. If there is no self to accumulate karma or merit, why does one still end up with it? Rinpoche: Ultimately speaking, accumulated karma and the individual who is accumulating karma are not separate, rather they are non-dual. When we speak of karma, we are speaking about something that appears in the face of confusion for a confused perceiver. Whether karma is virtuous or not, it is accumulated on the basis of the apprehension of duality. The final result of liberation or the state of omniscience is liberation from the imprints of both virtuous and non-virtuous karma. Karma is a phenomenon that is present in the experience of a confused consciousness. It can be said that ultimately there is nobody who accumulates karma and that there is no accumulated karma either. 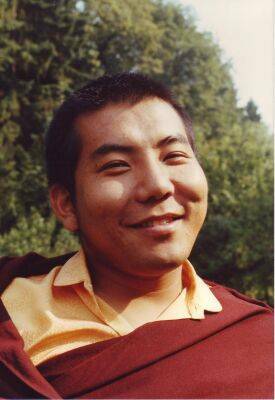 Instructions of Jamgon Kongtrul the Third presented in Montreal, Canada, 1990. Translated from Tibetan by Karma Yeshe Gyamtso, transcribed and edited by Gaby Hollmann, submitted to the website of Karma Lekshey Ling Institute in 2007, with deepest gratitude to Most Venerable Khenpo Karma Namgyal for his unwavering dedication and unfailing help.